Can House Republicans Put Big Spending Cuts into Action? Deficit Dilemma: Will Washington Finally Tackle the Sacred Cows? 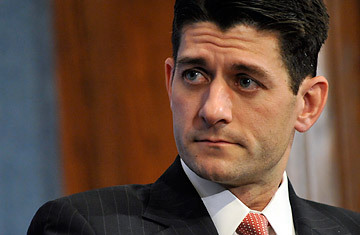 The Republican leadership's decision to tap Wisconsin Representative Paul Ryan, the House Budget Committee chairman, to deliver its response to the State of the Union reflects not just Ryan's ascendancy within the party, but also the degree to which budget and spending concerns will dominate the GOP agenda over the coming months. House Republican leaders know the voters who propelled them to power in November are wary of broken promises. They've cast the 112th Congress as a "second chance." When they were asked this week why the party opened the legislative session with a symbolic repeal vote on health care reform, the first response was often that they had pledged to do so. Even more than health care, the signature theme that stoked the GOP's midterm success was the need to slash federal spending. In their Pledge to America, party leaders vowed to cut $100 billion from the federal budget over the next year. Translating stump-speech politics into actual policy has been tricky. Both House Speaker John Boehner and majority leader Eric Cantor have repeatedly reaffirmed that commitment, even as colleagues like Ryan, who argue that a chunk of the fiscal year will have been squandered by the time a bill gets signed, have scaled back that forecast. There is a simple calculus to proposals like this: the gaudier the target, the greater its political appeal. "I have never seen the American people more receptive, more ready for the tough-love solutions," said Representative Jim Jordan of Ohio, the RSC chair. Maybe in principle. In practice, many of the folks who trumpet belt-tightening measures may balk when they learn it means sacrificing services most people see as valuable  from highway funding and Pell Grants to medical research and education funding. The nonpartisan Center on Budget and Policy Priorities estimates cuts in many key areas would surpass 40% under the RSC plan. Other items could wreak chaos on a fragile economy, including a repeal of Medicaid assistance to cash-strapped states and the privatization of Fannie Mae and Freddie Mac, which would introduce further turbulence to an already shaky housing market. The RSC proposal has as much chance of sneaking through a Democratic-controlled Senate as the health care repeal effort. But it could still have an outsize political impact. By inflating expectations within the Tea Party, the proposal could backfire on the party by boxing other factions into a corner. The Republican leaders had to take up the delicate task of lauding the study committee's efforts while backpedaling from its intent. "Our immediate goal is to cut spending to prebailout, prestimulus levels," a Boehner spokesman said in a statement. "That's what we pledged, and that's what we'll fight for. But that will be the beginning, not the end." The task of crafting those cuts falls to the Appropriations Committee, chaired by Kentucky's Hal Rogers. Appropriators are waiting for Ryan's budget blueprint  which itself is awaiting a Congressional Budget Office estimate expected this week  to begin imposing "the largest series of spending cuts in the history of Congress," according to Rogers' Jan. 19 statement. To do so, Rogers and his subcommittee chairs (known as cardinals) have the thorny task of navigating a middle ground between what's popular and what can actually pass. Without an appropriations bill controlling discretionary spending, the government could grind to a standstill, a prospect hanging over the committee's deliberations and invoked by rival Democrats. "We're not going to throw a trial balloon up there. This committee is not one to do a political document," says a House GOP aide. "No matter what number we get, we'll meet that number. We have to." Which means that Tea Party leaders, many of whom are already frustrated by the chasm between rhetoric about spending cuts and reality, may be primed for a disappointment. "Is there anyone in Congress who can politically do what I want them to do right now? Of course not," says Chris Littleton, president of the Ohio Liberty Council, a coalition of 58 grass-roots groups. Littleton, who opposes an increase in the federal debt limit and is willing to see the government shut down if necessary, says meeting specific benchmarks is less important than the principles guiding the effort. "Am I going to be thrilled by the number they come up with? Probably not," he says. "There's a lot of beating around the bush, a lot of campaign-type talk. It's all very vague." Vague vows to whittle down wasteful spending have been effective until now. By sketching out specifics, Republicans may find themselves on the wrong side of the very issue that vaulted them to power.